Thank so much for visiting my blog today. I had some fun this week making these cards. I love all the coffee stamp sets and sentiments that are available. They are so much fun to make and give to my friends and family. Dare 2B Artzy offers coffee and faith inspired stamp sets. I love combining the whimsy of coffee themed stamps with the seriousness of faith sentiments - such a great balance. 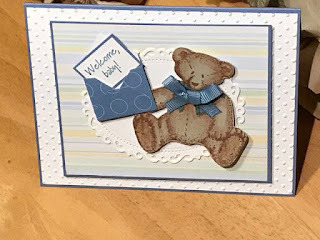 I used a classic color combination of browns and blues, embellishments and embossing. I really like using clear embossing powder to imitate steam and it gives a nice glossy texture to the stamped coffee cups. These cards can be used for any occasion or sentiment - even to just put a smile on someone's face. I love sending these cards to my coffee loving friends. I hope these cards give you some inspiration to make coffee themed cards. And you enjoy making them as much as I do. These cards and more are available on my Etsy shop. They are available individually or as a set (best price).